You’ll find lots of cheap and cheerful Halloween decoration ideas available in the shops, but they may not necessarily fit with the event you have in mind. Plastic pumpkins and ghost bunting can be a good fit for a kids party but if you’re planning a more sophisticated soiree or want to take some atmospheric photos, you may want to put a little more time and effort in. If you’re hosting a party for adults in your home, think particularly about your welcome area. You want to set the scene for guests as they arrive. Keep it classic with a creatively carved pumpkin on the porch or in the window and think about putting up a ‘welcome’ sign too. If you’re a talented chalk artist, a black board would work well but calligraphy on board and paper or digital art could also work for the occasion. Whether you want to tell guests to ‘Abandon ye all hope…’ or direct them to the dining hall, get creative with writing styles and illustrations. Want to work the scary angle? Have a scarecrow sitting in a dark corner as guests enter. Prefer something a little more fun and colourful? Pumpkin, ghost, bat, or witch bunting can brighten things up. Planning a Halloween themed meal or dinner party? You may want to play it a little subtler, think pumpkin or star table confetti, a black table runner and some soft lighting and seasonal wall prints. Lighting is so important for creating ambience at any gathering. Candle or pumpkin light can help to set a sense of uneasiness at the entrance and could well work at a dinner table too. 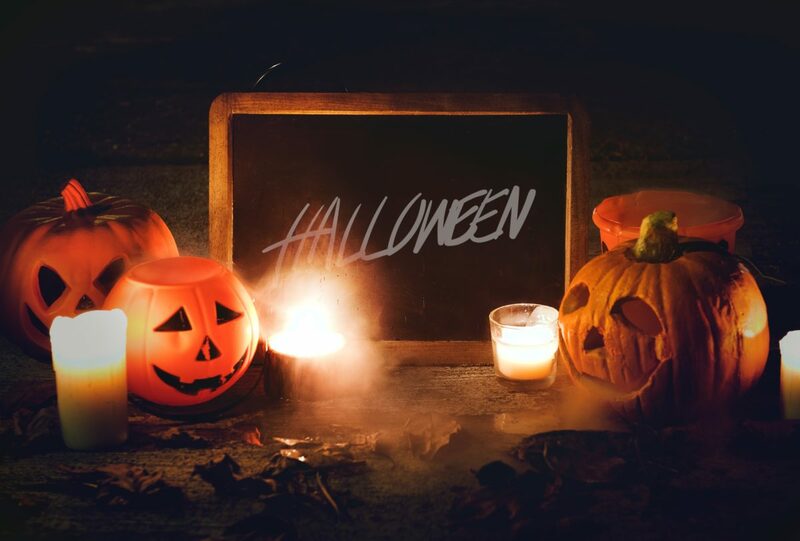 However, if you’re hosting a full on costume party with lots of guests, you’ll need to strike a balance between setting a spooky atmosphere and being fire safe and able to see! If you’re home is fitted with dimmers, you’ll have a head start when it comes to finding a good glow. You could also call on fairy lights and paper lanterns to add colour and magic. They’ll look fabulous in the photos too. Halloween has become a huge calendar occasion here in the UK. If it’s something you and your family enjoy year after year, you may want to think about buying or making a few investment décor pieces to stash away. This is something many of us do every year for Christmas without thinking. So why should you settle for plastic pumpkins and table covers for Halloween? You can involve the kids with making bunting or dioramas that can then be reused. Look out for day of the dead, sugar skulls and skeleton home wares that can come out when the season starts. And of course, don’t forget a cosy blanket you can all snuggle up under while watching scary films. Do you have a Halloween decorations box you re-use every year? We’d love to hear what type of décor you have stashed in it! Do you DIY your Halloween decorations?